Assisting Hands Home Care based out of Schaumburg and Park Ridge, IL was a recent sponsor for the Schaumburg Business Association 2018 Ladies Golf Outing presented by AMITA Health. Assisting Hands is a home care agency based out of Schaumburg, IL that provides in-home care services for senior citizens and adults with disabilities. 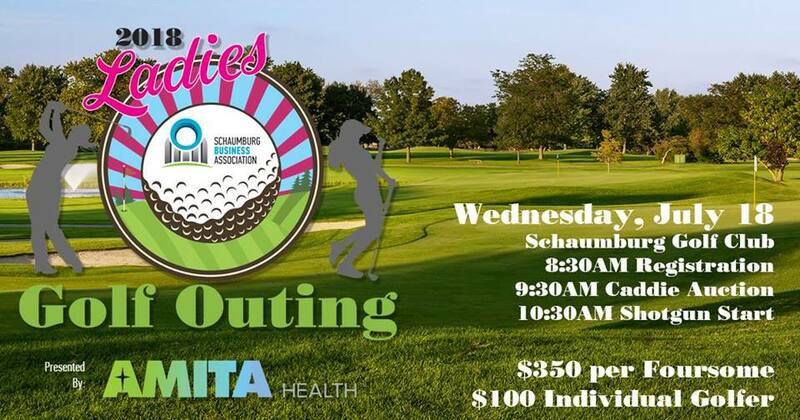 They are a proud member of the Schaumburg Business Association (SBA) and recently sponsored a table at the SBA 2018 Ladies Golf Outing presented by AMITA Health. In this SBA event, women were invited to have brunch and play 9 holes of golf at the Schaumburg Golf Club. The Ladies Golf Outing is one of many events that the SBA holds for its members throughout the year. The SBA Ladies Golf Outing starts with brunch and a Caddy Auction in which the participants bid on their favorite caddy for the day. The participants then play 9 holes of golf and meet back at the clubhouse for cocktails, games, prizes, and raffles. The SBA represents over 800 businesses in the Schaumburg, IL area and these events provide their members with a fun way to meet and network. AMITA Health, a recognized health care system that operates throughout the western Chicago suburbs, was the main sponsor of the event and Assisting Hands Home Care was one of several local businesses participating in the event. The Schaumburg Business Association (SBA) is a diverse association of businesses in the Schaumburg, IL area that includes corporate, industrial, commercial, retail, and service businesses. The SBA provides its members with programs, benefits, and services that advance business causes and help their members grow and prosper to maintain a competitive edge. AMITA Health is a health care system that serves over 1.2 million people throughout the northwest, west, and southwest Chicago suburbs. They are based out of Arlington Heights, IL and operate six acute-care hospitals, more than 80 clinics, and three specialty hospitals including a behavioral health hospital, children’s hospital, and rehabilitation hospital. AMITA Health has won several awards and is the third largest healthcare system in the state of Illinois. Assisting Hands Home Care is a home care agency that provides full in-home care services for senior citizens and adults with disabilities. They are based out of Schaumburg, IL and provide home care services for those in need in Schaumburg, Park Ridge, and the surrounding communities of Cook County. Their highly skilled and trained caregivers provide non-medical services to help seniors and adults with disabilities live comfortably and safely in their own homes. Aging in place is considered the best option for the well-being of senior citizens and Assisting Hands Home Care is committed to providing quality care for their clients as well as peace of mind for their families. Learn more by calling Assisting Hands Home Care at (847) 915-6186.